Kashmir Keratin System has revolutionized hair treatment. This advanced technology of using keratin capsules restores and restructures hair to provide the healthiest and most luxurious looking hair possible. This innovative and extensive line of products provides remarkable results in the shortest amount of time. Its use of keratin proteins rebuilds and strengthens hair to produce the most desired look. Customers will be amazed at the ease and efficiency of Kashmir Keratin System. Our Absolute Recovery mask targets the areas where hair is damaged, leaving it feeling more resistant and easier to manage. Hair looks smoother and softer from root-to-tip, thanks to the Multifunctional ingredients of Hidragloss with its conditioning and nutritive properties. Triglycerides containing the behenic chain provides softness, lipid replenishment and restructuring of the hair fiber. Hair is left full of shine and softness. 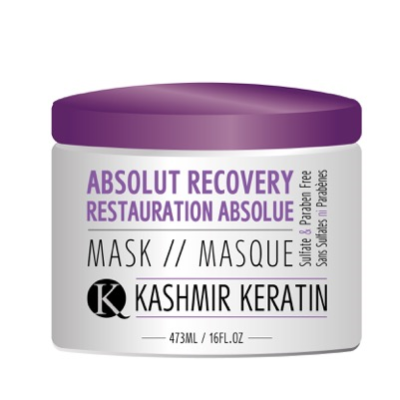 Our Absolute Recover mask conditions the hair strands and helps retain hair color. With the addition of Sensoeil and Serasil, the lipids reorganize the cuticles, improving separation and providing excellent sensory performance. A natural alternative to silicones. Cationic nanoparticles replace protein mass and protect damaged cuticles. Rich in keratin, it keeps hair strands soft and shiny. Improving performance and manageability while reducing frizz, adding conditioning and shine to hair. Hair feels more resistant to breakage Smoothens the look of hair adding shine Restores shine & Protects hair from damage. Helps repair split ends and prevents frizz. This light non-greaseless formula conditions, nourishes and protects the hair from the harmful effects of the environment and keeps hair healthy and shiny. No need to rinse. Moisture secreted by the scalp is not sufficient to reach and cover all of your hair, and therefore it becomes dry, especially at the ends. Hair conditioners reduce static electricity, help style hair, and most importantly – provide protection and prevent damage. Conditioner by Kashmir Keratin was formulated for hair that was straightened, using any one of the methods, and for hair that is frequently styled at high temperatures (blow dryer or ceramic straightener). The conditioner is especially suited for damaged hair: it helps build and restore the hair's structure, restore its flexibility, and give it renewed sheen and softness. The conditioner protects the results of the straightening and damaged hair using a double formula of Keratin with enriched amino acids – that renew the interior of the hair and create an external protective layer that encloses the hair and smooths its entire length. Preserves the effects of hair straightening 3 times longer – enriched with amino acids that reinforce the Keratin's effect, and strengthens the hair's resistance to breakage, heat damage, and chemicals. Salt-free – the formula does not contain sodium chloride, so that it prolongs the effects of hair straightening, and improves the hair's flexibility and softness after every use. Regular use of Kashmir Keratin's products will ensure that hair is left healthy, strong & revitalized. Kashmir Keratin's unique molecule formulas can identify and repair damaged & unhealthy hair, remove dandruff and other impurities and strengthen hair to restore it to its natural, healthy condition. Deep Conditioner by Kashmir Keratin was formulated for hair that was straightened, using any one of the methods, and for hair that is frequently styled at high temperatures (blow dryer or ceramic straightener). The conditioner is especially suited for damaged hair: it helps build and restore the hair's structure, restore its flexibility, and give it renewed sheen and softness. The conditioner protects the results of the straightening and damaged hair using a double formula of Keratin with enriched amino acids – that renew the interior of the hair and create an external protective layer that encloses the hair and smooths its entire length. Preserves the effects of hair straightening 3 times longer – enriched with amino acids that reinforce the Keratin's effect, and strengthens the hair's resistance to breakage, heat damage and chemicals. Salt free – the formula does not contain sodium chloride, so that it prolongs the effects of hair straightening, and improves the hair's flexibility and softness after every use. Kashmir Keratin Hair Biotex treatment is a deep conditioning treatment that reconstructs hair, producing frizz-free locks for all types of hair. Kashmir Hair Biotex treatments are also effective for rehabilitative care as they help fight hair loss. The antioxidants in Kashmir Keratin Hair Biotex all combine to hydrate and strengthen the hair by penetrating the hair cuticle and filing in the gaps and breakage. Our innovative treatment makes broken, frizzy, dull hair a thing of the past. Using a formula that is rich in enzymes and full of protein, Kashmir Keratin Hair Biotex will leave your hair soft and smooth for up to 16 weeks! 1. Wash hair with Kashmir Keratin clarifying shampoo. 3. Pour 60 ml of Kashmir Keratin Smoothing Treatment into the bowl. 4. Divide hair into 4 sections and apply the mixture onto clean, dry hair from root to ends. 5. Cover hair with plastic cap and let process 20 minutes. 6. After 20 minutes, check hair. If hair is still wet, blow the hair dry. 7. Divide the hair into 4 sections and begin to use a straightening iron to complete the process. The recommended temperature is between 350-450 degrees depending on hair density and condition. Make 3-6 passes with the flat iron; depending on the hair. 8. Let the hair cool down naturally, about 8-10 minutes and rinse the hair using Kashmir Keratin shampoo, followed by the Kashmir Keratin mask or conditioner. 9. For perfect results, style hair with a hairdryer. Kashmir Clarifying shampoo is one of the best ways to clean your hair thoroughly. Kashmir Clarifying shampoo helps open the hair shaft and clean them deeply, removing dirt and pollution: it removes residue, environmental dirt and air pollution emissions that fasten onto your hair over the course of the day. Kashmir Keratin Clarifying Shampoo is recommended for use before straightening and also before deep hair treatments, such as mask and ampule treatments that must be applied to very clean hair in order to attain optimal results.